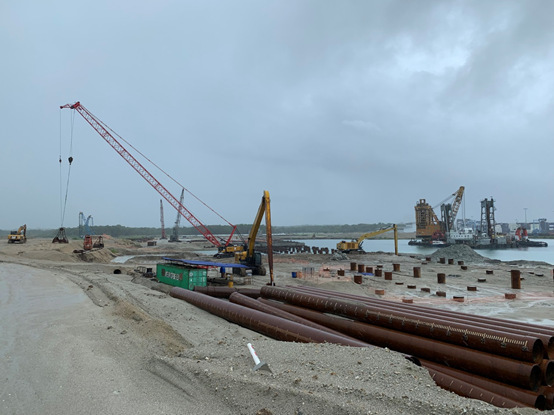 At a construction site at the estuary of Panama Canal to the Atlantic Ocean, growling gigantic marine equipment, caterpillar cranes, portal cranes and a 27-meter-long high-front shovel from China are busy with the expansion project of Margarita Island port. China’s Shandong-based Landbridge Group started the expansion project in June 2017 after it purchased the port situated in Panama’s Colón Free Trade Zone in 2016. Li Chao, a project engineer, said a port entrance was being built here as part of the expansion project for the Panama’s largest port. With an estimated investment of about $1 billion, it is one of the largest projects in Panama invested by companies from the Chinese mainland. It is also the first container terminal designed and built to match the Panama Canal new locks. The No. 3 container berth is scheduled to start trial operation by June 2019. By June 2020, the stage one will be operational, and the second stage of the project will start construction at the beginning of 2019. After its upgrade, the port will have an annual handling capacity of 5 million twenty-foot equivalent unit (TEU) cargoes and become the only one there to boast 150,000-ton container berths. It will further satisfy the operation of the canal and the demand for water transportation. Landbridge Group plans to increase the handling capacity of the port to 11 million TEU cargoes per year. The steady progress of the project is attributed to the development of China-Panama relations. According to Li, when they prepared for the project before the two countries established diplomatic ties, they had to wait for document approvals for months since the procedures to assess the project’s environmental impact and obtain the construction permits were very slow due to legal restrictions. Several days after the project kicked off, the two countries announced the establishment of diplomatic ties, which brought the construction to a new pace. The city of Colon had provided concrete support for Landbridge Group in construction safety and the recruitment of workers, Li disclosed. Alodiel, an official in Ministry of Labor and Workforce Development (MITRADEL) of Colon, said the Chinese company had created more than 2,000 jobs for locals, over 800 of which were related to construction jobs. Landbridge Group had provided a sound working environment for the workers and guaranteed their welfare. “There is a big cultural difference between us that has occasionally led to disagreements, but nothing is unsolvable through effective communication. Landbridge Group has become a good friend of us,” said the official. “I got along well with the Chinese colleagues here. In Landbridge Group there were staffs working on our welfare and labor and social security. Though the two countries were far apart, the hearts of the two peoples were bonded closely by the warm friendship,” Edwen Córdoba, a local employee, told People’s Daily. The port was highly automated, which would not only improve efficiency, but also guarantee the quality of services and reduce operating costs, Li said proudly. Additionally, the port had an obvious advantage in cost and was very competitive, Li said, disclosing that in the future a logistics park would be built here, which had already attracted interested Latin American countries for cooperation.